While the main event isn’t a huge draw, it’s a great fight for Fox. I’m not sure how long this stays up, but here’s a few different angles of Edson Barboza’s wicked wheel kick on Terry Etim at UFC 142. Sometimes, cards that don’t look great on paper turn out to be fun. As a fan, your expectations are lowered and you can just enjoy the action. 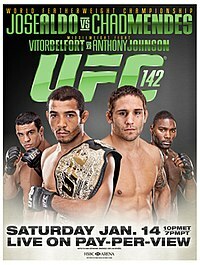 Let’s hope that UFC 142 is that way because on paper, it looks like a bit of an afterthought. The big news yesterday was that Anthony Johnson’s body shut down when he was trying to cut weight and he weighed in at 197 for a 185 pound fight. Vitor accepted the fight as long as Johnson didn’t weigh more than 205 this morning and Johnson has to give him 20% of his purse. The fight will go on. The first round featured a ton of leg kicks and some nice boxing. Neither guy really got the advantage and while a lot of strikes scored, no one was in trouble. Leg kicks may hurt Etim in the next couple rounds. Etim started to gain some momentum late in the round, but Barboza’s striking is more varied and he’s landing the harder shots. Etim needs to close out strong to win this one. Holy cow! Barboza threw a wheel kick and caught Etim right in the face with his heel. Etim went stiff and out. Well, that was fast. Silva landed a right hand, then a knee when Prater buckled and them hammer fists on the ground and it was over. Uh oh. The referee is going to take away Silva’s victory because of shots to the back of the head. There have been many worse occurrences of hitting in the back of the head. Silva got a raw deal. Surprisingly, fans are giving Yushin Okami more of a chance that I would’ve ever thought. Or maybe, they’re just trying to predict the day that Anderson Silva finally falls atop his perch of greatest fighter alive. In a poll I conducted on the Fight Game Blog Facebook page, Silva was clearly winning the poll, but out of 25 votes, 7 thought Okami was going to win. I’ll update the poll if it changes by fight time. Nedkov is just winging punches. Cane is too good of a stand-up fighter to to not take advantage of the sloppiness. Nedkov started off quickly and aggressively, but after being hit solidly a bit, he’s being more patient. And just like that, Nedkov blitzed him. He hit him with an overhand right and then a left and Cane was out on his feet. His legs were wobbly and he was trying to do the stanky leg. Nedkov then connected again and put his lights out. Wow. Winner: Stanislav Nedkov by way of 1st round TKO. Schaub looks a little soft while Big Nog looks a little thicker than usual. Looks like he wanted to have strength for Schaub. Schaub looked like he wanted to test Big Nog early and felt his power and decided to fight more cautiously. He’s trying to land an upper cut. And just like that, Big Nog put his lights out. That’s back to back wows for me.